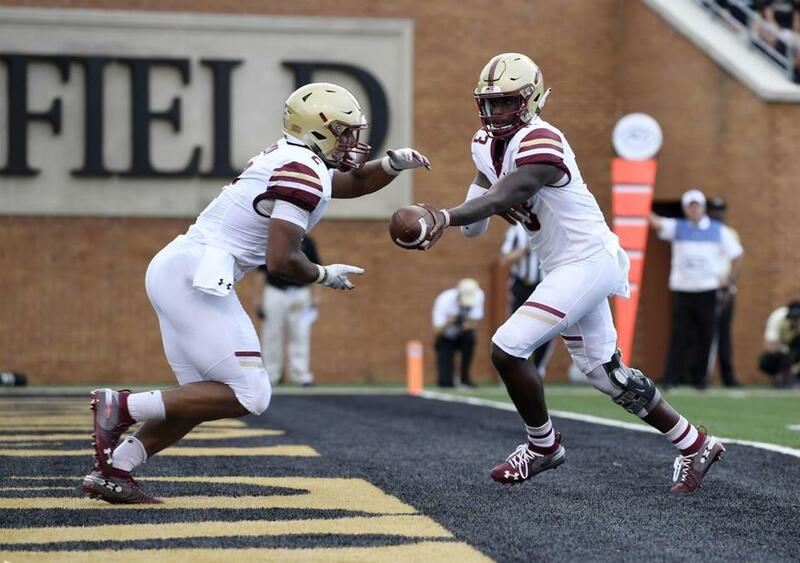 Boston College QB Anthony Brown hands off to running back A.J. Dillion, who rushed 33 times for 185 yards and 1 TD in Thursday night’s 41-34 Atlantic Coast Conference victory at Wake Forest. 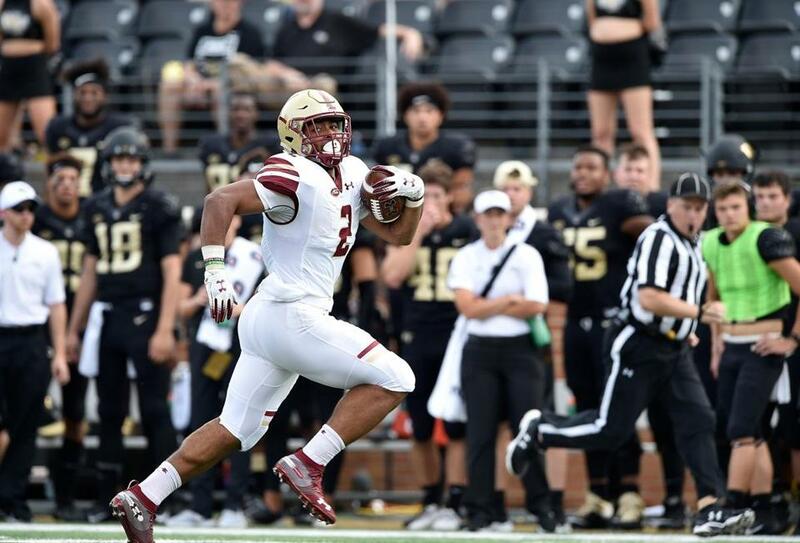 WINSTON-SALEM, N.C. — The moment a knee injury ended his season a year ago, just as he was beginning to blossom, Anthony Brown flipped the page on Boston College’s 2018 football calendar and stared down the Sept. 13 date against Wake Forest. His formal return to the field came in a season-opening win against UMass. His second time out felt like even more of a test run since he spent most of the game on the sidelines in another blowout win over Holy Cross. But the matchup with the Demon Deacons had special meaning. Wake was one of the 14 schools that offered Brown a scholarship. Instead, he spurned the Demon Deacons for BC. When he finally got to face them last season as a redshirt freshman, Brown threw three interceptions in a 34-10 loss. Even in the face of Hurricane Florence, which held off long enough to get the game in, Brown relished the chance to wash it all away Thursday evening in the Eagles Atlantic Coast Conference opener. Brown set career highs with 304 yards and five touchdowns on 16-of-25 passing as the Eagles walked out of BB&T field with a hard-fought 41-34 win. For the first time since 2007, the Eagles are 3-0 to start the season. It’s also been that long since an Eagles quarterback threw for 300 yards and five touchdowns. The last BC quarterback to do so was Matt Ryan, coincidentally against Wake Forest in 2007. No Eagles quarterback had thrown for 300 yards in a game since Chase Rettig did it against Wake Forest in 2012. Brown did it by using all of his weapons, hitting six different targets and finding four different receivers in the end zone. If there was any uncertainty about what impact his season-ending surgery would have on him this season, Brown said it wasn’t on his mind. After dominating UMass and Holy Cross, the Eagles were more concerned with answering larger questions. There was no doubting running back A.J. Dillon, who piled up 185 yards and 1 touchdown on 33 carries. But the Eagles used a dominant running game to set things up in the passing game. Receiver Jeff Smith had a career-day with a game-high 145 yards and two touchdowns. Tight end Tommy Sweeney caught five passes for 58 yards and a score. A.J. Dillion set the tone early, scoring from 45 yards out on his third carry of the game to give the Eagles a 7-0 lead. Dillon provided an instant spark with a 45-yard rumble to the end zone on his third carry of the game. But even if it seemed like the Eagles were primed for a runaway, Addazio said his team knew better. Coming in, the Eagles focus was on winning the turnover battle. Safety Will Harris and cornerback Hamp Cheevers each picked off freshman quarterback Sam Hartman (20 of 45, 214 yards, 2 TDs and 2 interceptions) to ensure the takeaways were sewn up. 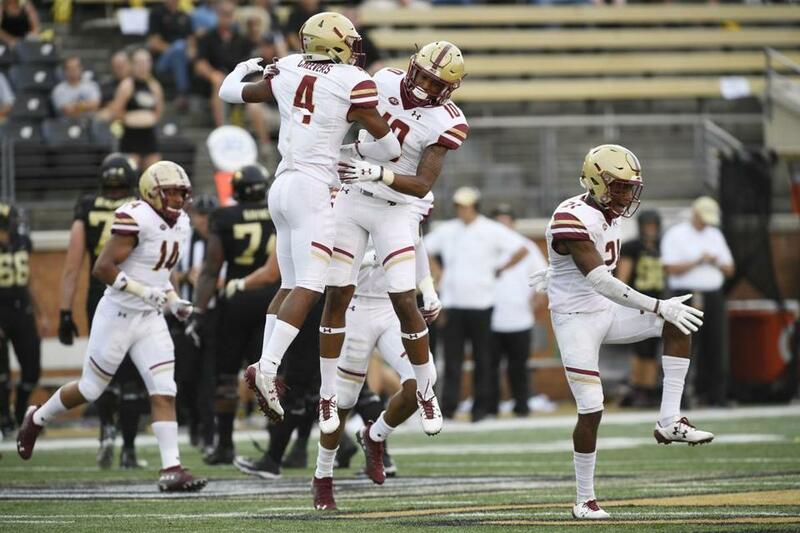 Hamp Cheevers (4) and Brandon Sebastian (10) celebrate Cheevers' interception during the first half of BC’s 41-34 victory at Wake Forest. But what the Eagles didn’t foresee were hiccups in special teams. A muffed punt return by Michael Walker (who hadn’t fumbled in two years) and a blocked punt by Grant Carlson set up scoring drives that kept the Demon Deacons alive. After going into the half tied at 21, Brown made sure it didn’t by throwing for 200 yards and three touchdowns in the second half. He had a 29-yard hook-up with Sweeney, a 71-yard pass to Smith and a 40-yard strike to Ben Glines that nailed the door shut. 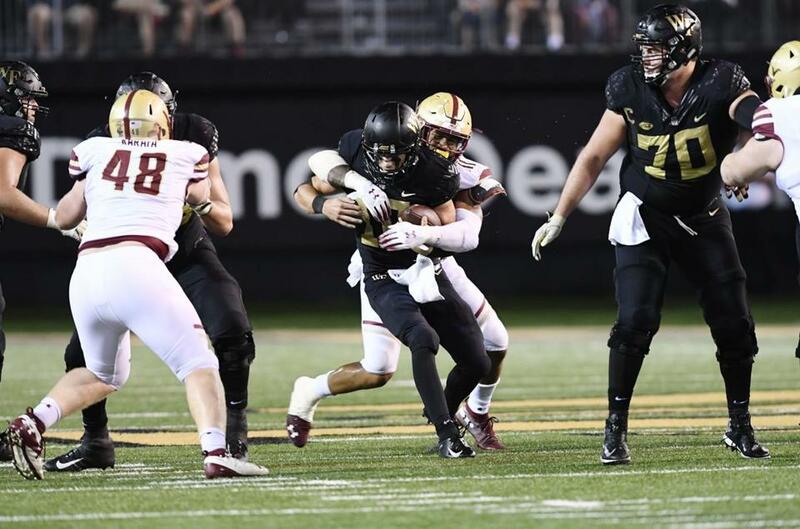 BC's Wyatt Ray (11) records one of his four sacks against Wake Forest QB Sam Hartman. Wake ran 105 plays and the Eagles defense was ready. Wyatt Ray set a school record with four sacks. Connor Strachan made a career-high 15 tackles.